The Blog of Small Things: The Greyhound...dah dah daaaaaaaaaah! Sounds exciting eh!! You'll be glad to know, riveting as the title sounds, that I will try to keep this brief. However, I felt this trip deserved a mention, if only due to the infamy of the North American bus company. Nothing super eventful happened but somehow it was one of the more surreal journeys we've undertaken. Having finished our course in Whistler and spent a few days taking in the sights of Vancouver we finally made the decision to head down to San Francisco to visit my aunty Jenny for a few days. We were right on the doorstep; it made sense to have some home time. Flights, too expensive; Greyhound, a bargain and only 24 hours...we could manage that, we'd travelled in India, Asia, the world. Besides we'd taken the Greyhound up and down between Whistler and Vancouver a few times and all seemed fine. It was only when we'd booked our tickets and started talking to Erin and Carolyn, our friends in Vancouver, that we started to have doubts. Turns out a madman notoriously decapitated someone on a Greyhound bus in Canada a couple of years ago, locked himself inside and proceeded to eat the dead man's head whilst traumatised escapee passengers looked on from outside. Nice...still, we told ourselves this could happen anywhere, right!? As we boarded our first bus in Vancouver's Pacific Station we got a glimpse of what the trip would be like...bizarre. The bus driver was a bit of a hicksville American type and liked the fact that on his bus, he was in a position of power. After interrogating us on the reasons for our trip he mumbled under his breath 'damn tourists...take a photo of me without asking and there'll be trouble'....funnily enough the thought hadn't even crossed my mind, I didn't tell him that. Once on the bus, he made a big speech about rules on his bus and said he didn't want to lose us at the border so had made us all glitter painted stars to attach to our coats. I felt like I was on a school trip in reception year ...I'm surprised he didn't ask us to hold hands. Computers go down at American immigration ('computer says no'). No back up or paper system so we stand there for 2 hours waiting=delayed. Meanwhile immigration staff laughing, pointing and philosophising over our glitter stars. Make our next bus despite delay (they held it for us) but one mile from the bus station we break down on the freeway. Tow sent out, police, lots of people yelling 'we are going to die' (don't ask me why - I think they'd all watched too many Hollywood films). Chaos. Know next connection is definitely doomed. In the fray ex-convict and current convict's girlfriend meet, bond, hook up and decide that she will go live with him....no kidding, that fast. Manage to find some lunch amidst pandemonium - phew! Get another bus...3 hours late at this stage. Portland - connection gone. Sit in waiting hall at midnight with a load of dodge types watching Piers Morgan interview the Dalai Lama...surreal. Finally get on a bus...5 hours delayed now - sleep overnight...badly. No dinner. Get to Sacramento and have missed yet another connection so 3 more hours delay - total 8. Eat a yoghurt and an apple (only things on offer apart from rank hot dogs, burgers and chips that are sure to equal certain death...) and watch fellow passengers stuffing themselves with fries, hamburgers and super duper sized 'soda'. It wasn't that bad a journey really, just so odd to see a side to America that you rarely experience, a side that only exists on the Jerry Springer show. People tell me that, socio-economically speaking, it really is the lowest 1% of the American population who take the Greyhound; I can corroborate this. Who thought that taking the bus would be such a revelation, a window into the scary realities of a country that purports to be the pinnacle of civilisation and sophistication yet appears as disorganised and poverty stricken as a third world country, at least in parts. I met more ex-convicts* on that bus than I have ever come across in my whole life (not difficult, granted, but still) and heard countless stories of financial hardship. 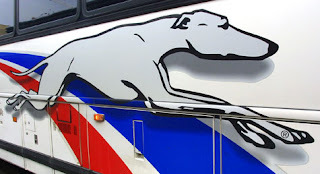 I wouldn't recommend a Greyhound journey to anyone, but if you want to challenge yourself and see some of the real America, give it a go, just be prepared for some very long delays and look after your heads! * I later learnt that prisoners who have just been released from prison are often given Greyhound tickets to any destination of their choice. This might explain the profusion of ex-criminals on the service!